The ancient city of Onobara in southern Turkey, which was home to civilizations like Lycia and Pamphylia, was seriously plundered by treasure hunters who also destroyed some historical artifacts and sarcophagi, the Doğan News Agency reported Tuesday. 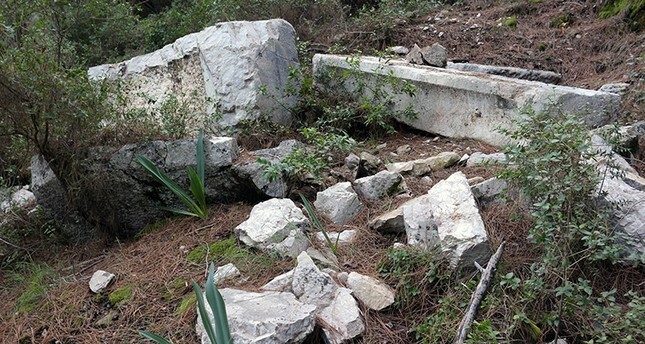 A group of hikers discovered the bad condition of Onobara, which is located in today's Hisarçandır 30 kilometers from Antalya's city center, and immediately informed authorities. The hikers also said that the ancient city of Onobara was now full of "molehills" as the treasure hunters had dug dozens of deep holes into the ground. Onobara was initially founded as a castle city of nearby Trebenna, which was an ancient city in Lycia and also bordered Pampyhlia. Antalya is known for its rich cultural heritage as the region was continuously inhabited from the Palaeolithic age to the Ottoman era.